"A taste worthy of the Gold Label"
Produced from red and yellow chilli that are hand picked to get the freshest and best quality available. 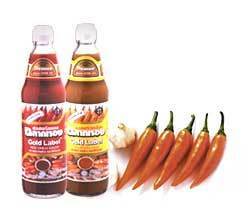 Gold Label's Fresh Chilli Sauce is produced by an advanced hygenic manufacturing process that ensures a delicious chilli sauce that contains no flour, coloring, or preservatives. The result is a natural color and hot taste suitable as a dipping sauce complementing fried or grilled dishes. It also gives a unique flavor to Thailand's world-renowned Tom Yam soup.